Ergonomics is a popular workplace theme in today’s industrial era, especially in jobs like assembly and manufacturing. Is investing in ergonomics really worth all the hype it’s been getting? Read on about why we found ergonomics is important in the workplace, then let us know what you think. 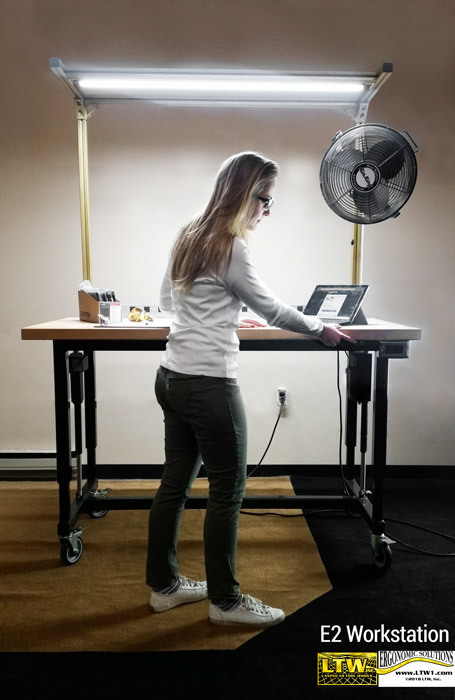 By decreasing the levels of repetition and awkward postures in the workplace with ergonomic solutions (such as the height adjustable E2 Workstation), risk factors that lead to discomfort and even major MSD (musculoskeletal disorder) injuries are prevented. Ergonomics is a statement of your company’s commitment to safety and health as a core value. Healthy and happy employees are your most valuable asset, leading to better human and company performance. Employees notice when their company puts forth their best efforts to ensure health and safety on the job. If an employee does not experience fatigue and discomfort during their workday, it can reduce turnover, decrease absenteeism, improve morale, and increase employee involvement. If OSHA paid your company a surprise visit tomorrow, do you think your ergonomics would pass their standards? Even if there are no guidelines specific to your industry, employers are still obligated under the General Duty Clause, Section 5 (a)(1) to keep the workplace free from recognized serious hazards, including ergonomic hazards. Providing and implementing an ergonomics program at your company will ensure you’re doing everything possible to prevent such injuries from taking place. Lawsuits can be prevented when injuries are prevented with ergonomics. Statistics from OSHA reveal that workers’ compensation expenses cost businesses $15-$20 billion each year. To make matters more expensive, the Institute of Medicine estimates that the total annual economic burden resulting from workplace MSDs adds up to $45 to $54 billion. Is your company included in those paying billions of dollars for workplace MSDs? Ergonomic improvements can reduce primary risk factors for MSDs, resulting in workers being more efficient, productive, and having greater job satisfaction. Poor ergonomics leads to frustrated and fatigued workers that don’t do their best work. When the job task is too physically taxing on the worker, they may not perform their job like they were trained. The average direct cost of a workers’ compensation claim for an MSD is $14,120, and the indirect costs involved bring the total average claim cost to well over $32,000. While implementing ergonomics might at first seem like an unnecessary cost, it has a great ROI. To attract the best employees to your company, you must show you care about their health and safety. Ergonomics is one of the best ways to proactively display your care. What do you think? Is ergonomics important in your work? Share this article on Facebook, Twitter, or LinkedIn with your thoughts.